Host a Jewelry Trunk Show! Modern in design, with swirling details and soft edges, three lab rubies are nestled into the metal, and seem to glow from within. 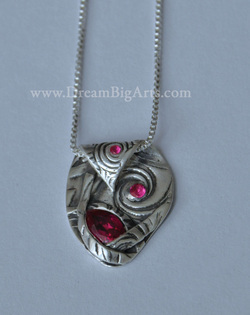 The stone of "eternal fire", rubies make a special gift for yourself or someone you know with lots of "fire" in them. Handmade, one of a kind.